I love the outdoors – I’ve spent time camping in the outdoors since I was born, and have been actively hiking and backpacking since then. I consider myself a lightweight hiker, usually carrying 20 – 30 pounds (9-13 kg) for hikes up to a week in length. I hike at an easy pace, averaging 2 mph (3 kph). I am a one-man tent camper for now. I like to carry a single trekking pole when I hike to help relieve stress to my legs and knees. I like to get out on the trail as often as I can. The Sun Protection Zone Rashguard shirt is a snug fitting shirt that is made of tightly woven yarn that reminds me of spandex material. The hang tag that came attached to the shirt says "high density yarn 4-way stretch fabric is comfortable to wear, dries quickly and stands up well to chlorine and salt water." It is part of their Quick Dry Series which absorbs sweat from skin surface to the outer layer of the fabric within 1 second. Better moisture management, breathable and fast drying. The Rashguard also promotes sun protection as the shirt has built in SPF and UPF factors. The Sun Protection Zone Rashguard shirt arrived in a box inside a clear plastic bag. The shirt arrived in great condition and what appeared to be the same as what is shown on the web site. I did notice a big graphic picture on the back of the shirt that I was not expecting. This does not hinder the performance of the shirt no does it deter me from wearing the shirt. I just didn't expect it. Below is the picture of the graphic. I checked all the seams and everything seemed to be of good quality and craftsmanship. As you can see here below, the side seams and hem are nicely stitched. 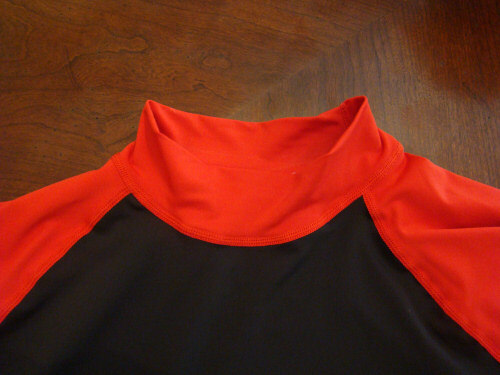 The collar comes up slightly, much like a mock turtle neck. After trying on the Rashguard shirt it fits very nicely. I like the length of the arms as they come down to just above my elbow. The mock turtle neck gives good coverage on my neck and doesn't feel constricted at all. The rest of the shirt is form fitting to my body and makes it feel as if I could wear another layer if needed and not feel any bulkiness. The fabric stretches nicely when putting on and pulling the shirt off. I will be using the Rashguard on my hikes, around the river, at the beach and posibly on some mountain bike rides. I will be wearing the shirt on outings where the sun is out and not much cloud cover. I want to see how well the sun protection works. I will also be wearing it in the water on certain occasions to see how well it performs in the water and to see how the fabric reacts when wet and against my skin. I will also see how fast it dries while on and off my body. 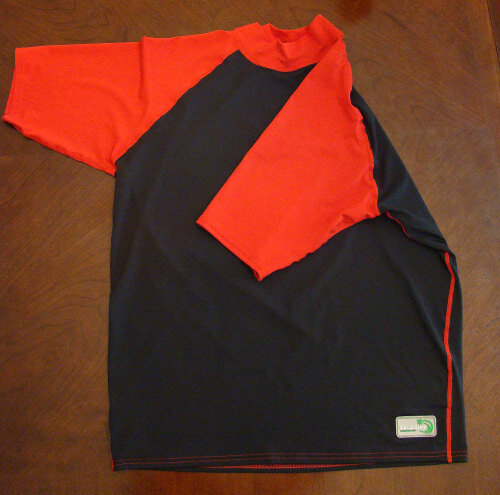 I have worn the Sun Protection Zone Rashguard shirt on a couple of hiking trips and a beach trip. The hiking trips consisted of day hiking in temperatures that ranged from 85 F to 100 F (30 C to 37 C). One of the hiking trips was in the Paris Mountain State Park where I took a 5 mile (8 km) loop hike and the elevation ranged between 800 ft. and 950 ft. (244 m and 290 m). The second trip was to Kings Mountain where I did a 6 mile (9 km) hike out and back. The elevation there ranged between 1,200 ft. and 1,400 ft. (366 m and 427 m). I wore the Rashguard shirt on my hiking trips thinking it would be a nice cool shirt meaning that I suspected that it would feel light and the wind would blow through the material and keep me cool. For the first mile or so it did okay but after my heart rate rose and I started sweating, the shirt didn't feel so good. The sweat just never seemed to escape and therefore I felt hotter than what the temperature felt outside. For testing purposes I kept the shirt on and continued with my hike. For the most part I had to grab a bit of the fabric with my fingers and pull the fabric away from my skin rapidly to get so air to flow up and down in the shirt to keep me cool. I didn't really have a problem with the shoulder straps or any part of the pack rubbing my shoulders or any chaffing. It actually felt nice to feel the pack secure to my body. My back did sweat tremendously but that was to be expected. After these two trips with the shirt as a hiking shirt I started to do a little research and figured out that it really isn't designed to be a breathable hiking shirt. I mean why would they put a surfer logo on the back of a hiking shirt. I knew I was going on a beach trip with my family so that is where I took it to try out. 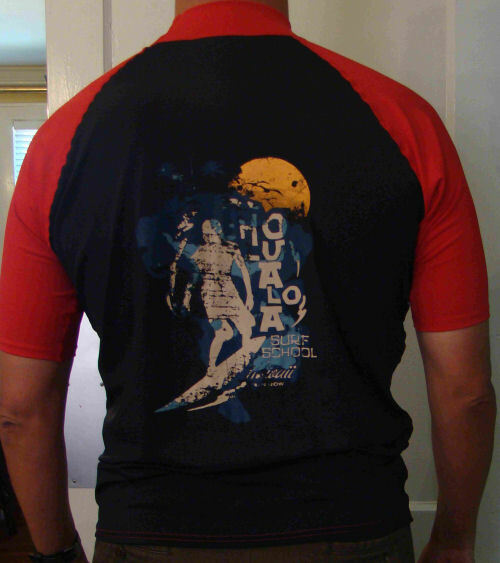 I found out real quick that the big thing now, for surfers, are rashguard shirts. The rashguard shirts, as this one is, is to keep the skin from rubbing against the surf board or boogey board and chafing the skin. So, since I had one, I got myself a boogey board and out to the ocean I went. I've always thought that it felt weird having a t-shirt on in the water but this is different. It actually felt good and the shirt actually kept me cool while I was in the water. The shirt has a built in SPF and UPF and so I felt safe in the sun with the length of time that I spent in the water. By doing this it let me know that this shirt is really made for the water and not really for hiking unless getting in the water is part of the trip. It didn't work well for me at all as a stand alone hiking shirt. I will be taking the rashguard shirt on a few more outings but only as an underlayer if the temperatures start to drop. It fits tight against the skin and it seems like it will work well as a base layer. Since my field testing report, I have taken the Rashguard shirt out on two more occasions. Both trips were camping trips where I used the Rashguard as a base layer. One of the trips was a two night stay around a lake where the elevation is 855 ft (261 m) and the temperatures range between 70 F to 75 F (21 C to 23 C) during the day and 55 F to 60 F (12 C to 15 C) during the night. The breeze came off the water and made it seem cooler than the actual temperature at night. The second trip was a two night stay to a camp with my sons Boy Scout troop. It was located in N.C. in a big field where the elevation is 2,100 ft. (640 m) and the temperatures there ranged between 75 F to 80 F (23 C to 26 C) during the day and 30 F to 40 F (-1 C to 4 C) at night. In both situations the Rashguard worked great. I realize this is not what it is designed for but it worked well for me. The closeness of the fabric was comfortable but not to restrictive. I was able to layer over it fairly easily and with the sleeves being short, it kept my body temperature regulated. As far as the seams, they were comfortable where they were and did not irritate my skin at all. Again, I realize this is not what this shirt is designed for but it worked well for me as a base layer and by this, it lets me use the Rashguard all year long in all the different seasons. The quality of the fabric has been top notch and the fabric has not been picked at all. But of course, the fabric was never rubbed up against anything rough or encountered any sticks or brush either. Except when I was at the beach and in the river, the Rashguard was always under layers of clothing. Thank you Sun Protection Zone and BackpackGearTest.org for this opportunity.